Emma Hayes guided Chelsea to the domestic double last season. 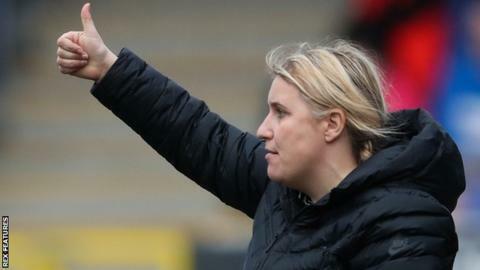 Barclays' multi-million pound sponsorship of the Women's Super League is a "watershed moment" for the game, says Chelsea manager Emma Hayes. The three-year deal, understood to be in excess of £10m, starts next season. "You need somebody like Barclays to say 'I'll be the first'." Hayes, 42, told BBC Sport. "The interest is growing. It's a snowball-effect and I can't see anybody getting in the way of England becoming the best place in the world to play." Hayes, whose side won the domestic league and cup double last term, added: "The women's game is at a tipping point. We'll see more deals like this announced over the next year or two from around the women's football world. "There had to come a point where somebody said 'I'm investing in this for all the right reasons', not just as an add-on. I've been saying for some time that I felt this would be the watershed moment, where we would commercialise the game. Barclays chief executive Jes Staley said: "To be able to put our support behind women's football is a great initiative for the bank. "The momentum is clearly behind the sport and we'll see women's football grow tremendously across the United Kingdom." Hayes was speaking prior to her Blues side facing French club Paris St-Germain at Kingsmeadow on Thursday, in the first leg of their Women's Champions League quarter-final. No English side has won Europe's elite women's club competition since Arsenal in 2007. But Hayes believes the WSL is now the envy of all other women's leagues. "This will be the best league in the world, if it's not already. It'll be an unbelievable league in a couple of years," she said. "Tell me another league in the world that can attract a sponsor like that with this level of investment. It's brilliant. "We're making unbelievable progress. It's moving so quickly, you almost don't want it to move too fast, because we need to be able to maintain everything around it. "But this is the exciting point I've waited for." Asked where she thought the English game would be in 10 years, Hayes replied: "I'm so excited. The work that's been done in this country in the past five years should be celebrated. "We are setting the tone, the trend, and the way in the world. It had always been about America, but now, sorry, they lag behind us. "English football's time is coming. I think the rest of Europe fear our country and our clubs and they're quite right to do so. "The best players aren't going to America, they're staying in Europe and in fact they're coming to England." England's top league will be rebranded the Barclays FA Women's Super League from next term, and will include a prize-money pot of £500,000. Barclays' sponsorship deal will also see them become the lead partner of the FA Girls' Football School Partnerships, a nationwide scheme to help develop girls' access to football at school. "We'll create 100 girls' football schools partnerships across the country, involving around 6,000 schools, making sure girls have opportunities to play right from a young age," the FA's director of the women's professional game, Kelly Simmons, told BBC Sport.